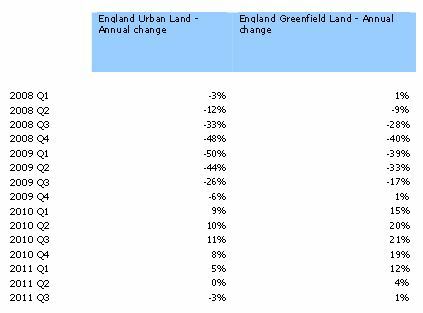 Average English residential land values are more than 40% lower than their peak at the end of 2007. “Demand for residential land remained strong for desirable locations, especially in the South of England, but slowed in the North, resulting in a slight slowdown in the overall demand for land across the country. In some marginal areas, especially in the North of England, the appetite for sites is negligible. Some sites are simply not viable given the state of the local housing market. 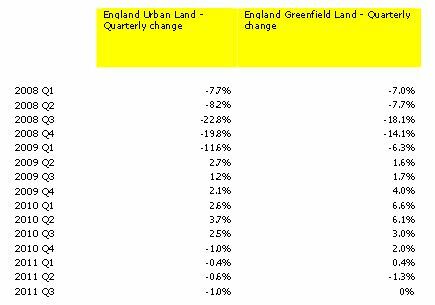 “Supply of land outside London rose by 9% over the quarter, while demand increased by 3%. “The differential between the markets for land in the best locations and land which is poorly situated continues to widen, with agents reporting that the difference between demand levels and pricing can vary from road to road in some areas. “The very best schemes, including prime sites in and around market towns, especially in the South are still attracting interest and there is stiff competition between bidders. But poorly-located land is now available at heavily reduced prices. “Funding remains an issue, putting larger housebuilders, who have better access to credit, at an advantage. “The economic gloom has also taken a toll on the market, particularly in regions which have seen a large rise in unemployment, as have the continued constraints in the mortgage market, with many first-time buyers cut off from accessing home loans unless they have a large deposit. The confusion over the planning regime is also having an impact on the market and will likely continue to do so until the rules become clearer. “Public sector bodies remain the primary sellers across the country, but speculative land investors and private land owners were also active during the quarter, especially in the East Midlands. “Residential developers and housebuilders remained key buyers across the UK, although housing associations also stepped up their activity in the West Midlands between June and September.